Teachers have the critical task of designing effective leaning experiences that address their students’ individual developmental needs, advance their deep knowledge and multiple literacies. Teachers do this in a dynamic education context that requires them to respond to evolving state-defined curricula and expectations for quality teaching pedagogies that integrate appropriate technology. This presentation reports on the research design and findings the first phases of a current Australian study that aims to understand how teachers engage in the design of learning experiences for their students. This knowledge is a critical step to informing the development of improved strategies and resources for initial teacher preparation and ongoing teacher professional learning. To achieve this aim, the researchers argue that it is necessary to re-conceptualise what comprises teaching by drawing attention to teachers’ design work. As such, this study focuses on teacher design thinking as the teachers’ cognitive process when engaging in the pedagogical design of a teaching program level – a coherent series of lessons that make connections across the curriculum and cumulatively build students’ knowledge and skills. However, the study also recognises that, while design thinking may be considered an individual cognitive act, ultimately teachers work in a social context that is influenced by social norms; government policy; school strategy, rules, resources; and interactions with fellow teachers (Hargreaves & Fullan, 2000). Recognising both the individual and contextual aspects of teacher design work, the study is theoretically significant by integrating cognitive and socio-cultural approaches to investigate teacher design. Using Activity Theory (Engeström, 2001) to frame the study, we conceptualise the teacher (subject) designing a teaching program (object(ive)) within a system comprised of rules, community, division of labour, and technical and psychological tools. To investigate the psychological tools of teacher design we draw upon cognitive psychology concepts of expertise particularly associated with case-based reasoning and teacher knowledge schema. Experts have extensive, well-structured prior knowledge on which they draw to make connections between past experience and a new situation, focussing on the deep structure of a problem and making links based on general principles (Lawson, 2004). Expert teachers draw upon their own past teaching experience or the teaching experiences shared by others. Further, eexpertise in teaching involves activating a highly organized systems of knowledge (Berliner, 2004). Specifically, teachers choose effective strategies specific to the concepts being taught, known as ‘pedagogical content knowledge’ (Shulman, 1986) which has been more recently extended to include the technological domain (TPCK) (Mishra & Koehler, 2006). How do expert and novice teachers think about and approach the design of learning experiences? How do evidence-based models stimulate novice teachers’ design thinking? The approach particularly allows us to investigate design as it is occurs rather than relying on participants to accurately recall their process after the event. In three of the phases, participants were asked to respond to a realistic design problem, designing a teaching program of learning activities and assessment which fit the Australian Curriculum and cater for cross-curricular opportunities; support multiliteracies learning outcomes; integrate technologies available in schools; and be grounded in quality teaching principles. Design artefacts (e.g., notes, documented program, etc). The aim of Phase 2 was to refine the characterisation of expert and novice teacher design thinking using data collected within participants’ work settings, and identifying key concepts and processes that can be documented through a design thinking model. Studying design thinking in the naturalistic setting adds further detail about how design processes and influences occur in context. In addition to the procedures of Phase 1, data was collected to investigate the implementation of the designed teaching program, including: a design diary for participants record further development of the program and details of its implementation and a telephone interview before and after the program was taught. Phase 3 focused on analysing the data collected in the previous phases to develop a model to stimulate design thinking. Both inductive and deductive analysis techniques were used to identify differences and commonalities in expert and novice approaches to design. Key findings identified experts’ emphasis on designing diagnostic, formative and summative assessment activities for students, considerations for differentiation based on student abilities, refinements based on available school resources, and opportunities for their own professional learning. The findings were then integrated into a design thinking model to be tested in the subsequent, and final, phase of the study. The presentation provides an overview of the research design, detail findings from the first two phases of the project and present the design model developed based on these findings. Berliner, D. C. (2004). Describing the Behavior and Documenting the Accomplishments of Expert Teachers. Bulletin of Science, Technology and Society, 24(3), 200–212. Engeström, Y. (2001). Expansive learning at work: Toward and activity theoretical reconceptualization. Journal of Education and Work, 14(1), 133-156. Lawson, B. (2004). Schemata, gambits and precedent: some factors in design expertise. Design Studies, 25(5), 443-457. Mishra, P., & Koehler, M. (2006). Technological Pedagogical Content Knowledge: A Framework for Teacher Knowledge. Teachers College Record, 108,(6), 1017–1054. Lauren Knussen recently presented an overview of her current PhD studies investigating how teachers design for technology integration at the Teachers’ Guild of New South Wales annual research awards presentation night. The abstract of her presentation is below. There is often much commentary in the media on whether our efforts to integrate technology in school education are working (Phillips, 2015). Research about teachers’ integration of technology into teaching and learning has focused extensively on teachers’ skills and knowledge (Bate, 2010), teachers’ practices in the classroom (Pegrum et al., 2013; Orlando, 2013), and barriers to technology integration (Ertmer, 2005). Research participants in these studies on technology integration have predominantly been identified as either pre-service teachers or in-service teachers, with little focus on teachers at the beginning or in the early years of their careers. What is missing is an understanding of how teachers design technology-integrated units of work and how this design work is influenced and impacted by the teachers’ context. The study presented here addresses this gap while focusing on an under-researched group of teachers. Early career teachers are an important group to focus on because they are dealing with the stress and complexities of their first years in the classroom, as well as dealing with the steep learning curve of integrating technology in a pedagogically sound way (AITSL Teacher Standards). This study is currently underway with seven early career primary teacher participants from government, catholic and independent sectors. An in-depth longitudinal case study design is used to follow each participant as they design, teach and reflect on a technology-integrated unit of work in their classrooms. By incorporating a mix of observation and interview methods, the study aims to increase our understanding of key influences on the participants’ design practice before, during and after teaching a unit. It is anticipated that findings from this study will inform our understanding of how to better support teachers’ integration of technology, both prior to qualification and in the early stages of their careers. Shirley presented (on behalf of the team) a synthesis of our work focused on examining higher education teacher design practices – in both a poster (see below) and part of a Learning Design Research in Action Symposium – https://twitter.com/jasonmlodge/status/803075760470704128. Shirley visiting Davinia in Barcelona! 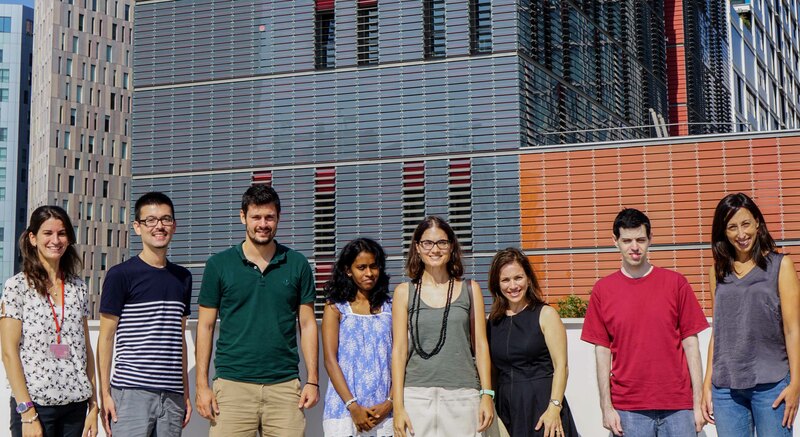 Shirley Agostinho visiting Davinia Hernández-Leo and team at UPF campus in Barcelona in September 2016.